Born in Winnipeg, Andy Van Hellemond's hockey career as a player began in Winnipeg's Isaac Brock area. He spent three seasons in the MJHL and was a member of the 1967/68 MJHL Champions, St. James Canadians. After junior, Andy began to officiate in various Manitoba leagues eventually moving on to the WCJHL and then working minor pro games. He caught his NHL break in 1972 filling in for an injured Bruce Hood. For the next 25 years he would go on to earn the rank of the league's number one official an unprecedented 14 times. He holds all refereeing records for the league, including most regular season games (1,475), most playoff games (227) and most appearances in the Stanley Cup Final (19). 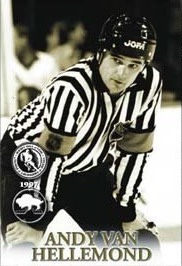 He would referee the 1979 Challenge Cup in New York between the Soviets and NHL All-Stars as well as 4 games in the 1981 Canada Cup series. He was the referee for the 1985 NHL All-Star Game in Calgary and the 1987 Rendez-Vous Series in Quebec City between the Soviets and the NHL All-Stars. In 1984, he was the first NHL official to wear a helmet in an NHL game. He would referee his last NHL game on June 8, 1996. In 1999, Andy Van Hellemond was inducted into the Hockey Hall of Fame. Andy was the Senior Vice-President and Director of Operations for the East Coast Hockey League and has served in senior officiating positions for the NHL.